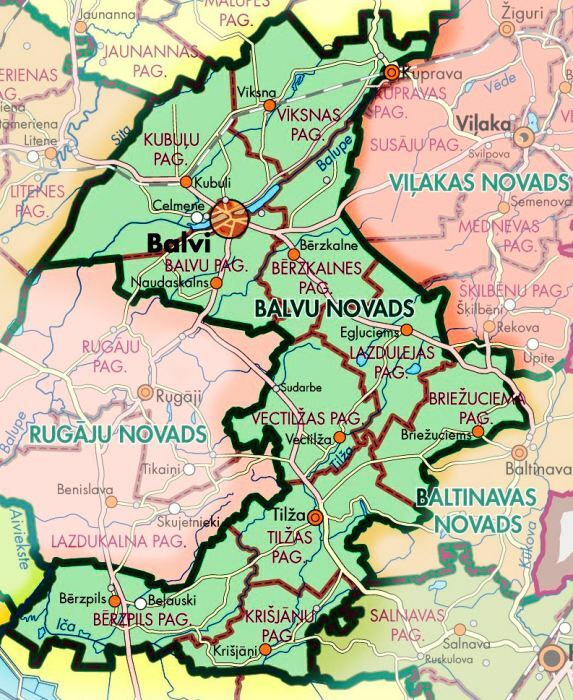 Balvi municipality is located in the north-east of Latvia and it is the gate between Latgale and Vidzeme regions. Balvi municipality includes Balvi town (administrative center) and 10 parishies - Balvi, Kubuli, Vīksna, Bērzkalne, Lazduleja, Briežuciems, Vectilža, Tilža, Bērzpils and Krišjāņi. 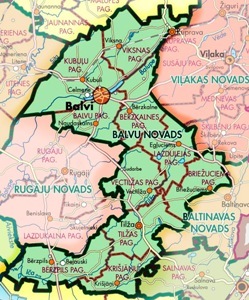 Balvi municipality is bordering with Rugāji Viļaka, Baltinava, Kārsava, Rēzekne, Lubāna, Gulbene and Alūksne municipalities. Distance from Balvi to Rīga is 220 km. Municipality area is ​​1045.26 km2. The population of Balvi is approximately 13 400, half of them live in Balvi town. The most significant country roads crossing municipality are Gulbene-Balvi-Viļaka-Russian border (Vientuļi), Balvi-Kapūne, Rēzekne-Gulbene and Viļaka-Kārsava (road of the project "East Gut"). Municipality is rich of forests, rivers and lakes and agricultural land. Using these resources the main business of municipality are agriculture, logging and wood processing. Some households focus on the bee-keeping, fish farming and other non-traditional forms of agriculture. Balvi municipality aware itself as an important north center of Latgale, where ethnographic and nowadays cultural traditions have been maintained. Different artistic amateur collectives are working in the cultural institutions of Balvi municipalities. Also local, regional and state scale cultural events are held in the municipality. There is available education of all levels- from pre-school till highest education. Art, music and sports schools as well as youth initiative centers are running in the municipality.